Warm yourself up in a flurry of sparks! 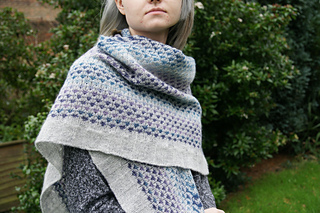 Knit down and out from the top center, Spark of Grey is a symmetrical triangle shawl with a flair for texture. Slipped stitches create the two-color pattern, while the wide ribbed border adds a romantic, ruffled touch. Knit it in Cloudborn Fibers Alpaca and Highland Naturals, a 50/50 blend of superfine alpaca and fine highland wool, for a super cosy shawl.